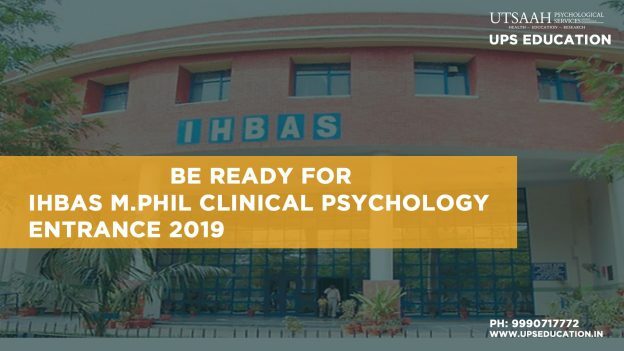 Applications for M.Phil Clinical Psychology admission in IHBAS and GMCH is going to be out soon. Boost your preparation before applications will release, Must prepare under the instructions of your mentors or renowned faculty. Start your preparation with UPS Education’s new batch starting from 06-May-2019 for M.Phil Clinical Psychology Entrance and NTA NET JRF Psychology. Explore your preparation with our Gold Medalist faculty and give a boost to your practice with our exclusive online Psychology Mock test. Contact @9990717772 for more details. This entry was posted in psychology coaching class and tagged IHBAS M.Phil Clinical Psychology Entrance, m.phil clinical psychology coaching on April 20, 2019 by UPS Education. Institute of Human Behaviour and Allied Sciences (IHBAS), located in Dilshad Garden-Delhi, is one of the cowered hospitals in Delhi NCR for mental health patients. Also, it’s one of the prestigious institutes in India for M.Phil Clinical Psychology Course and accredited from RCI, New Delhi. Let discuss the few pros and cons of IHBAS and we will also see the entrance pattern/syllabus for M.Phil Clinical Psychology Entrance in this institute. Entrance examination consists of 100 MCQs within 1 hour and 30 minutes from Post graduate level Psychology course. IHBAS M.Phil Clinical Psychology Entrance Exam usually held in month of August. 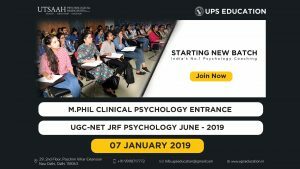 This entry was posted in mphil clinical psychology entrance, psychology coaching class and tagged IHBAS M.Phil Clinical Psychology Entrance, ihbas m.phil clinical psychology syllabus, ihbas m.phil entrance syllabus on February 20, 2019 by UPS Education. On different platforms like Facebook, Instagram, YouTube, WhatsApp and Quora; a considerable number of students ask similar questions to us. 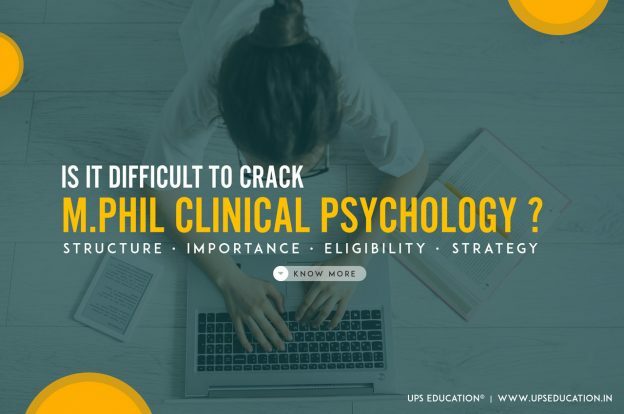 Generally, questions are related to- ‘how to prepare for the M.Phil Clinical Psychology Entrance written exams as well as the interviews, the best books for M.Phil Clinical Psychology Entrances, etc. So we have tried to answer all of these questions today through this article. 1. The course structure and importance/relevance of this course. In India, the courses in Clinical Psychology are regulated by the Rehabilitation Council of India (RCI) and M.Phil in Clinical Psychology is one of the most popular and prior course among all of these courses. Only the individual who completes this course is considered as a Clinical Psychologist according to RCI. It is a two-year course including both the modes of learning i.e. the practical/ clinical training and the written examinations. After the completion of this course, the licenced individual can start his/her practice as a clinical psychologist in any government psychiatry or clinical psychology department/hospital/institute/ rehabilitation or else they can start their own clinical practice. 2. Who can take admission in this course? Students who have completed their masters in Psychology with at least 55% of marks can apply for the entrance examinations but there are different criteria for admissions in different universities and hospitals; for example there are few universities which do not offer this course to those students who have completed their master via distance/open learning mode. For such cases, you must check the university/institute’s prospectus to confirm the eligibility criteria or collect this information from our website before applying. 3. How difficult it is to crack the M.Phil Clinical Psychology Entrance examination? Mostly, the level of the difficulty of the exam depends upon the number of seats available and the number of students applying for it. 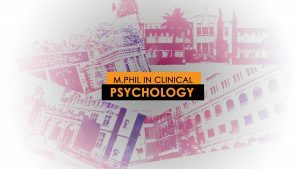 M.Phil Clinical Psychology course is a two-year regular hospital-based and in hand training course and to due to the shortage of resources and the facilities; the number of available seats is less. Therefore, the gap between the number of seats (which is very less) and the number of applicants (which is obviously very huge because of RCI guidelines) makes it one of the most difficult examinations. But always keep in mind that there are difficulties can be handled with the right approach and systematic study while preparing. This entry was posted in mphil clinical psychology entrance, एम फिल क्लिनिकल साइकोलॉजी, एम फिल नैदानिक मनोविज्ञान on February 11, 2019 by UPS Education. This entry was posted in career in psychology, Psychologist, psychology job on January 15, 2019 by UPS Education. 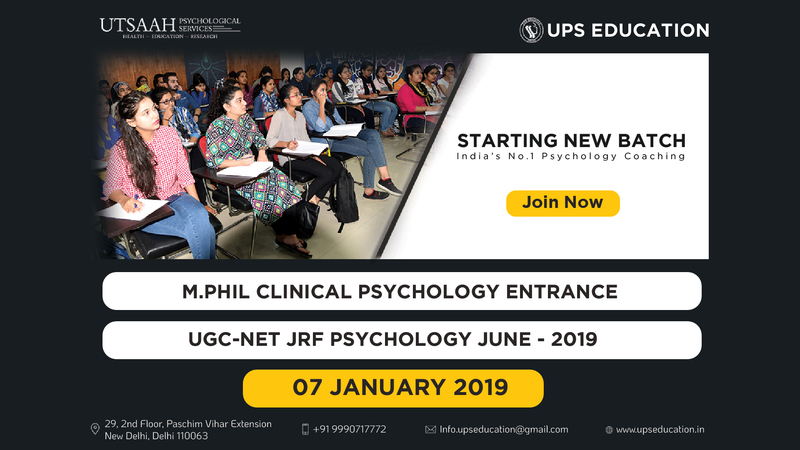 New Batch for M.Phil Clinical Psychology Entrance and NTA NET JRF Psychology June 2019 Preparation. Batch is starting from 07-Jan-2018. The course will cover all M.Phil Clinical Psychology Entrances of 2019 and NTA NET JRF Psychology exam which going to be held in June/July 2019. Strat your preparation today and increase your chance. This entry was posted in Best CBSE NET Psychology Best CBSE NET Psychology, Best NET Psychology Coaching in Delhi, CBSE NET JRF Psychology Coaching, M. Phil Clinical Psychology Coaching and tagged M.Phil Clinical Psychology Entrance Coaching, NET Psychology Coaching on December 27, 2018 by UPS Education. 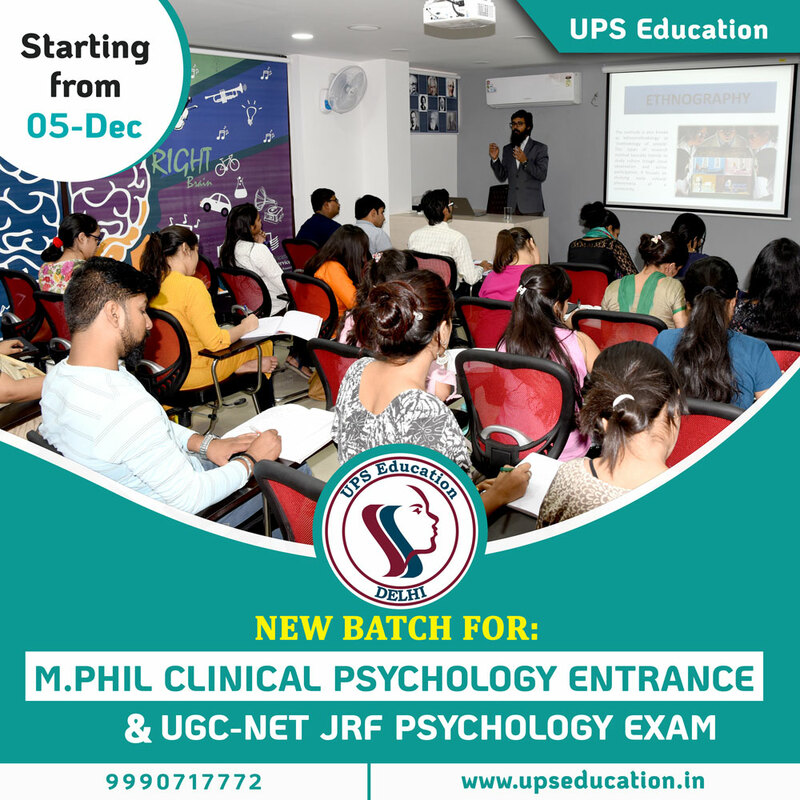 UPS Education going to start a new batch for the preparation of M.Phil Clinical Psychology Entrance, this batch will focus on NIMHANS and CIP’s M.Phil Clinical Psychology Entrance of 2019. This entry was posted in Coaching for M.Phil Clinical Psychology Entrance, m phil clinical psychology coaching, mphil clinical psychology entrance, एम फिल क्लिनिकल साइकोलॉजी, एम फिल नैदानिक मनोविज्ञान and tagged m.phil clinical psychology coaching, m.phil clinical psychology entrance on November 22, 2018 by UPS Education. 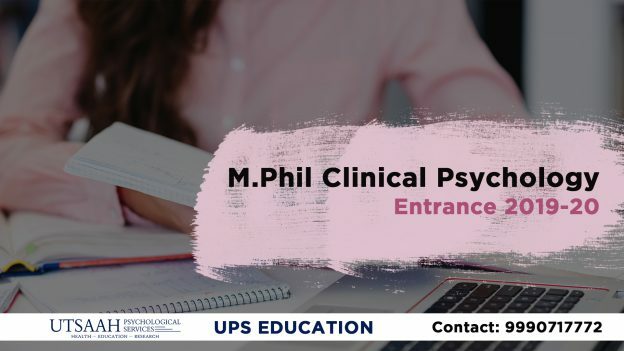 Dear M.Phil Clinical Psychology students, are you preparing for M.Phil Clinical Psychology Entrance 2019? Then, it is time right time to start your preparation, applications form will start from January 2019. Stay aware and start your preparation early. NIMHANS, CIP, RINPAS, IHBAS, RML, GFSU, KGMU and other are the best options for your M.Phil Clinical Psychology Course. Contact UPS Education (India’s No.1 Psychology Entrance Coaching) for any help and guidance for M.Phil Clinical Psychology Entrance. This entry was posted in Admission, approaches of psychology, m phil clinical psychology coaching, M. Phil Clinical Psychology Coaching, एम फिल क्लिनिकल साइकोलॉजी, एम फिल नैदानिक मनोविज्ञान and tagged best psychology coaching, clinical, clinical psychology, psychiology, psychology, rci approved clinical psychology entrance on October 27, 2018 by UPS Education. 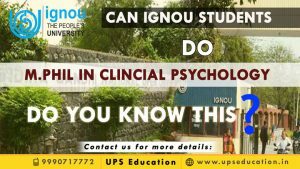 Many students want to know, that is it possible to do M.Phil in Clinical Psychology after doing MA in Psychology through distance education (IGNOU)? 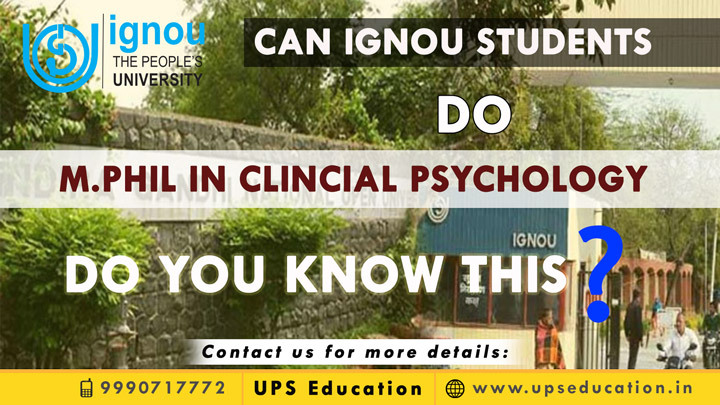 The very first question is frequently asked by students: Can IGNOU Students Do M.Phil in Clinical Psychology from with RCI licence? Answer: Defiantly! You can do M.Phil in Clinical Psychology, even if you did your master from IGNOU, but you have less options as compare than those students who completed their master from regular mode. Next Questions which students asked to us: From Which University we can do M.Phil Clinical Psychology Course? Answer: In India, each university follows its own admission criteria. So in this case you need to check the list of Universities or Hospitals go got the RCI approval for the current year. NIMHANS, CIP, IHBAS, and GMCH these are one of the prestigious institution in India for M.Phil Clinical Psychology course but they do not allow to those students who have completed their master degree from distance mode. 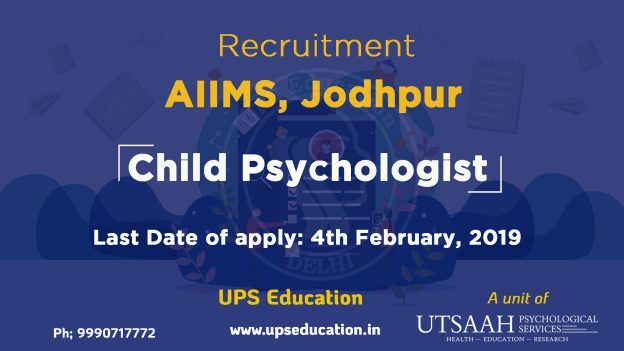 You may apply in PGI Raipur, LGB Regional Institute of Mental Health (Tezpur), Gwalior Mansik Arogyshala, IMHANS Chennai, Amity University, SGT University, GBU and other universities, you may check on their website. Other question asked by students is: Will they get Licence after this course, and will it valuable? Answer: Yes! You will get the licence from RCI after complacence of this course. And defiantly it is as valuable as other regular student got licence from any other RCI approved university. This entry was posted in approaches of psychology, IGNOU, m phil clinical psychology coaching, M. Phil Clinical Psychology Coaching, psychology, एम फिल क्लिनिकल साइकोलॉजी, एम फिल नैदानिक मनोविज्ञान and tagged can we do m.phil in clinical psychology, m.phil clinical psychology for ignou, m.phil in clinical psychology for ignou students on October 24, 2018 by UPS Education. This is the right time to start your preparation, if you want to appear in 2019 M.Phil Clinical Psychology Entrance. Join India’s No.1 Psychology Coaching and Increase your chance of admission. This entry was posted in M. Phil Clinical Psychology Coaching, mphil clinical psychology entrance, एम फिल क्लिनिकल साइकोलॉजी, एम फिल नैदानिक मनोविज्ञान and tagged top institute for clinical psychology, Top Six Universities & Hospital for M.Phil Clinical Psychology in India on October 16, 2018 by UPS Education. 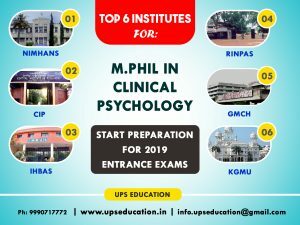 Crack your MA/M.Sc Psychology Entrance of 2019 and got admission in Top Most Universities of India for Psychology Course. It is the right time to start your Preparation for your Masters Psychology Entrance for DU, JMI, BHU and AUD or other universities. Early start can helps you more it’s provide you extra time for practice and revision also. 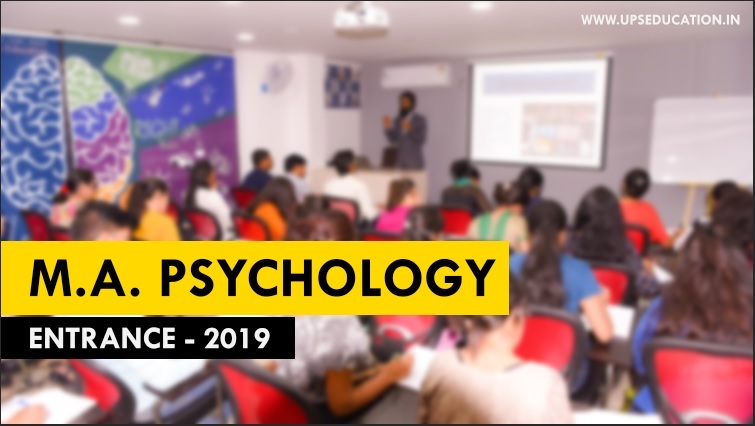 Start your preparation today for 2019 Psychology Entrance, Join India’s No.1 Psychology Entrance coaching and increase your chance. This entry was posted in MA Psychology Coaching and tagged MA Psychology Entrance, msc psychology entrance on October 11, 2018 by UPS Education.